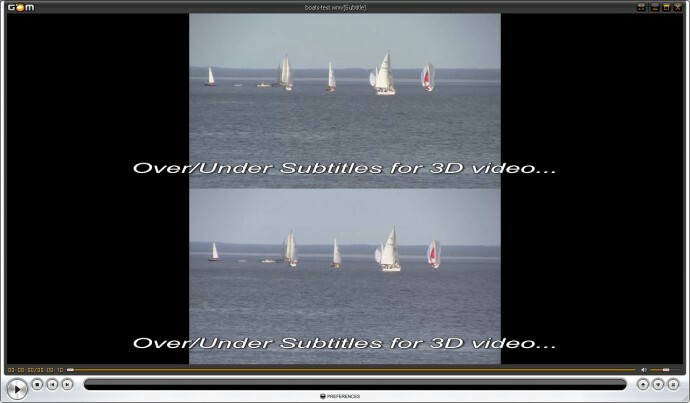 As you might know the Nvidia 3D Vision Video Player is actually a special free version of Peter Wimmer’s Stereosopic Player that is limited to support only 3D Vision. Unfortunately the official version of the Nvidia 3D Vision Video Player hasn’t beep updated for a while (already almost a year now) and the last official version you can download is 1.7.5 while at the same time the Stereoscopic Player is currently up to a version 1.9.9 that has just been released a few days ago. 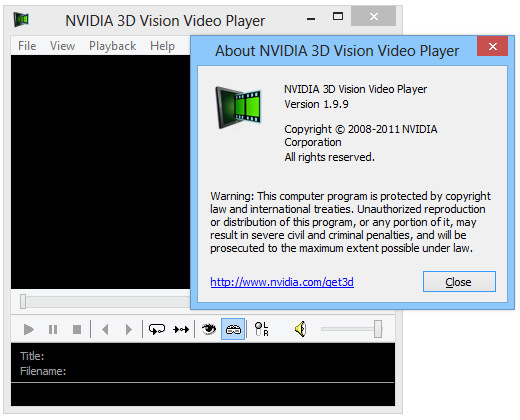 Fortunately there is a very easy way to bring your Nvidia 3D Vision Video Player up to date to the latest version getting all the bug fixes and improvements available. You have to copy the license file from a 3D Vision Video Player installation, it is called “StereoPlayer.cst” into the folder where you have installed the latest version of Stereoscopic Player overwriting the file there. And next time when you run the Stereoscopic Player it will run in 3D Vision Video Player mode. Have in mind that this workaround will just enable the 3D Vision Video Player functionality using the latest version of the Stereoscopic Player, it will not enable the full extra functionality that is found in the full Stereoscopic Player. It is just a simple way to have the 3D Vision Video Player up to date. If you need the extra functionality of the Stereoscopic Player you should get a license for the Stereoscopic Player. 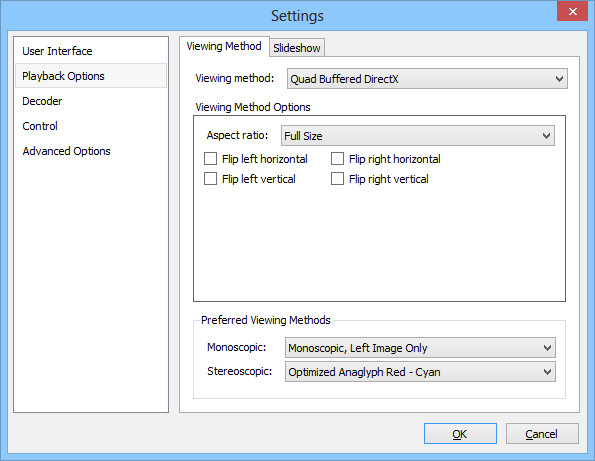 One of the common complaints by the new to 3D users from the usual 3D video players such as the 3D Vision Video Player and the Stereoscopic Player is that they lack some features that have been common for quite a while on other 2D video players like Media Player Classic, KMPlayer, GOM Player, VLC etc. Unfortunately none of these few very popular and widely used media players does have full stereoscopic 3D video support, but some of them do have some useful features for people watching 3D videos as well. I’m going to be talking about the GOM Player here, as it is one of the first to implement some stereo 3D-related features in its official version and more specifically 3D subtitle support. This means that when playing back 3D video sin Side by Side or Over/Under format you would be easily properly overlay 2D text subtitles over the video in a proper format, so that you would get 3D subtitles displayed at screen depth. An easy to use functionality built into the GOM Player that everyone can use without having to go through adding additional filters and configuring them as is the case with using the ffdshow subtitles filter for example, but also not as flexible and as functional as the external ffdshow filter for subtitles. 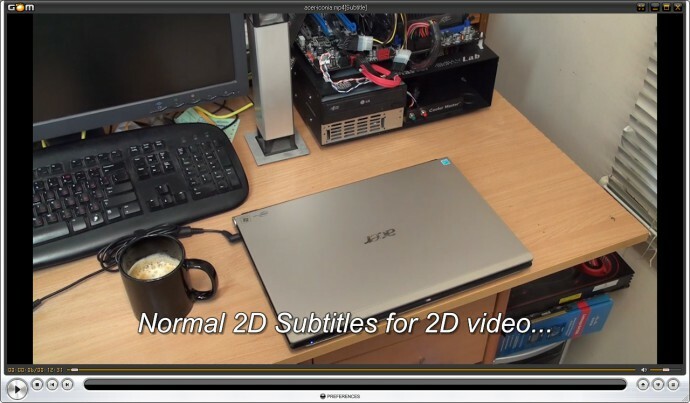 To activate the 3D subtitles support in the GOM Player you need to right click on the video player, select the Subtitles menu, 3D Subtitles Mode and choose Disabled for 2D subtitles, Left/Right Mode for Side by Side and or Top/Bottom Mode for Above/Below videos. Have in mind that the choice you’ve selected remains until you close the player or select something else, so even if you play a 2D video after watching a 3D video with activated 3D subtitles support, the subtitles will still be shown “doubled” in the 2D video, so you would have to switch to 2D mode. Closing the player and then running it again however resets the 3D Subtitles mode to the default Disabled state, meaning the normal 2D video support. 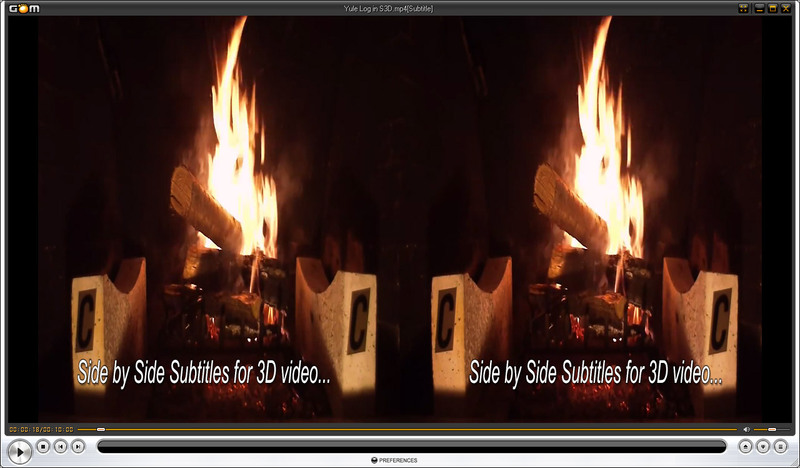 When switching the subtitles to a different mode for 3D videos the on-screen messages overlayed on the video from the player also change correspondingly to reflect the 3D format of the video being used. What is left however is to also do the same with the playback controls of the player at the bottom of the screen that still render in 2D. So a job well done for the authors of GOM Player, but there is more to be desired in terms of stereoscopic 3D support that can be added in the software. Have in mind also that the 3D Subtitles functionality of the GOM Player is only useable for playing back 3D videos with subtitles on 3D HDTVs with manually activating Side by Side or Above/Below input mode. GOM Player does not support HDMI 1.4 frame packaging or frame sequential output for 3D content and is not compatible with stereoscopic 3D solutions such as the 3D Vision, so it is not a complete replacement for the 3D Vision Video Player or the Stereoscopic Player, just an alternative that you may use in some cases.